Rock Creek Sports Club – Powerhouse of Power Lifting! 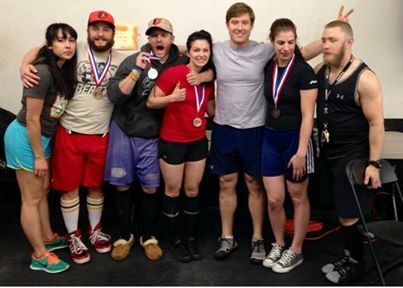 Congratulations to the Power lifters of Rock Creek Sports Club! Four Rock Creek Sports Club employees and three members competed in the USAPL Colosseum Push/Pull Challenge Saturday, June 14, 2014, with spectacular results! Held in Columbia, MD, RCSC participants broke personal records and walked away with four medals! A strength and conditioning specialist at Rock Creek Sports Club, this was Devin’s third power lifting competition and his first without a weight belt. With a personal best of 529.1 lbs in the deadlift and a 352.7 bench, Devin earned a gold medal in his weight class! For his second power lifting competition, Zach went 6 for 6 of his lifts. He had a personal best of 468.5 for the deadlift and a personal best of 270.1 for the bench press. Zach also performed his lifts without a weight belt. Competing in his third competition, Robert earned a silver medal in his weight class, completing 5 of his 6 lifts! His winning deadlift was 523.5 and his bench was 308.5. Competing for her first time, Emily completed 5 of her 6 lifts! After months of training with Devin, Emily was able to pull in a personal best of 253.5 for the deadlift. Ashleigh is Devin’s sister, power lifting runs in the family! Ashleigh not only won the gold medal in her weight class but also broke the Maryland state record for the deadlift with a lift of 325.2! Competing for the second time, Kristy won the silver medal for her weight class! She pulled a 319 for the deadlift and pushed 132 for the bench. Also competing for the second time, Kevin hit personal bests of 512 in the deadlift and 265 on the bench. Once again, congratulations for a very successful competition! We are very proud of the hard work and focused dedication that these Rock Creek Sports Club employees and members demonstrated to reach their goals and achieve these results.